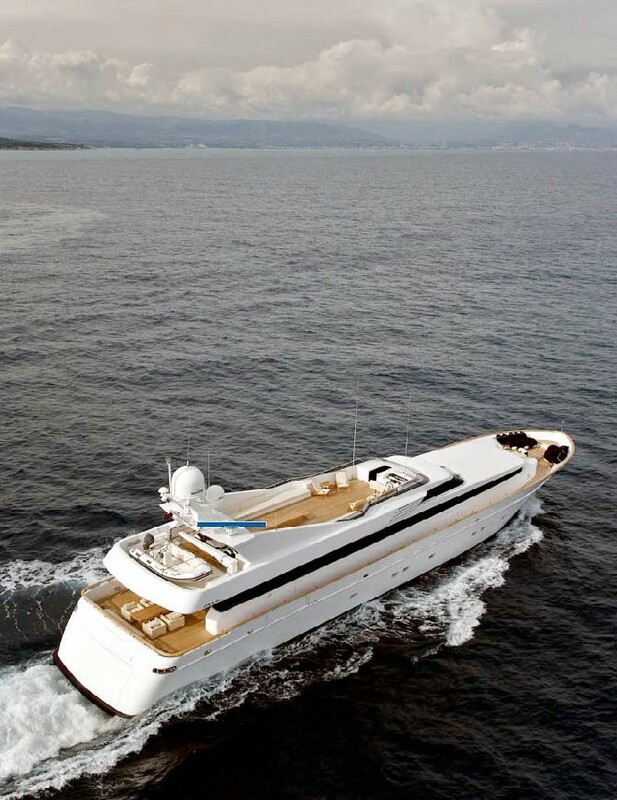 Motor yacht Mabrouk is a 38,30m (125' 7") Cantieri di Pisa charter yacht launched in 2004 from the design studio of Studio Porfiri. 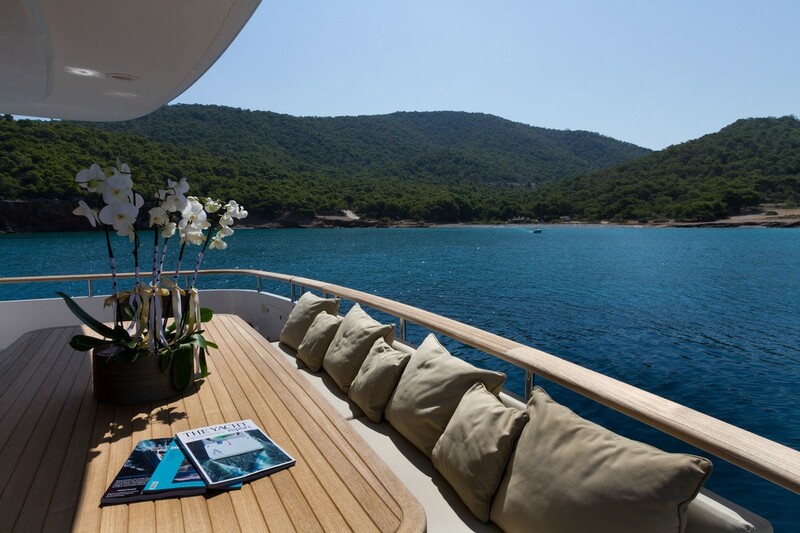 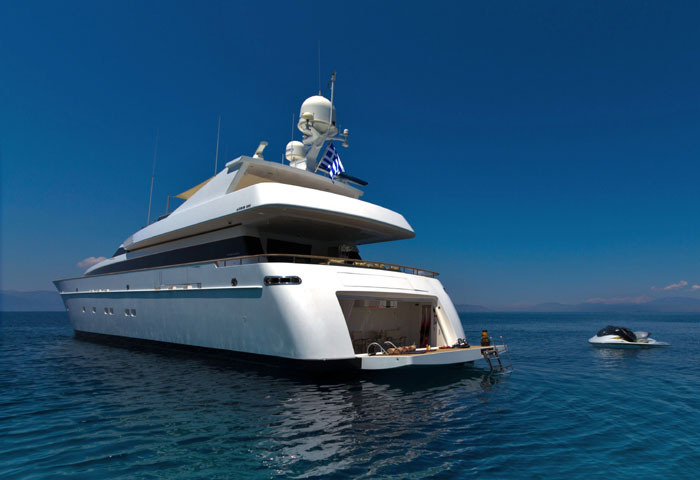 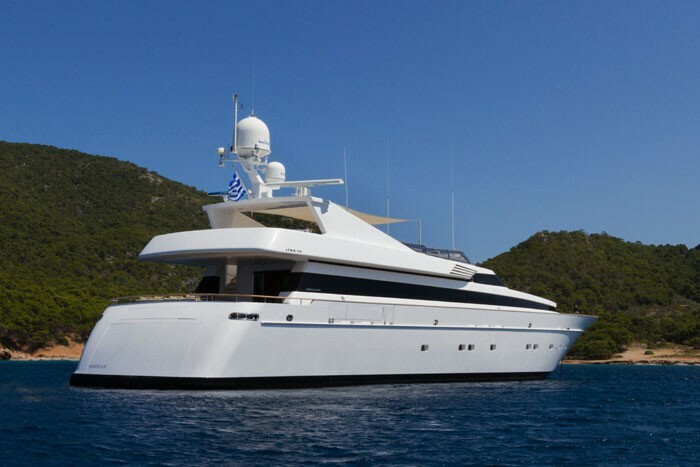 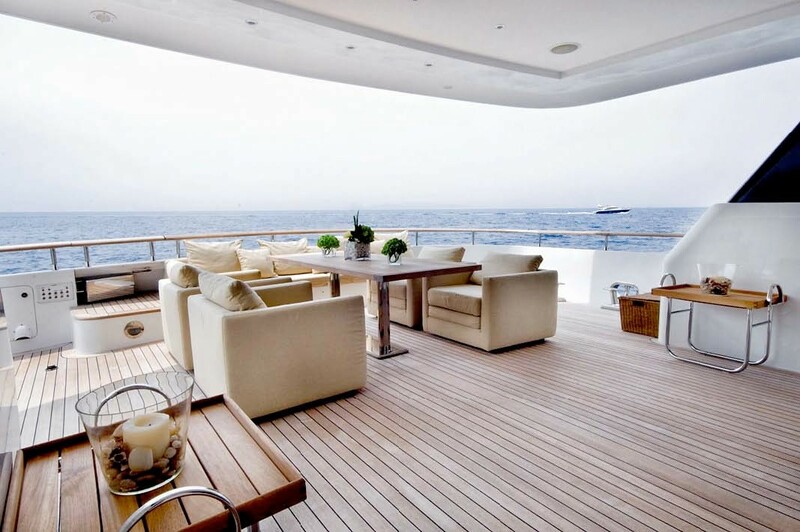 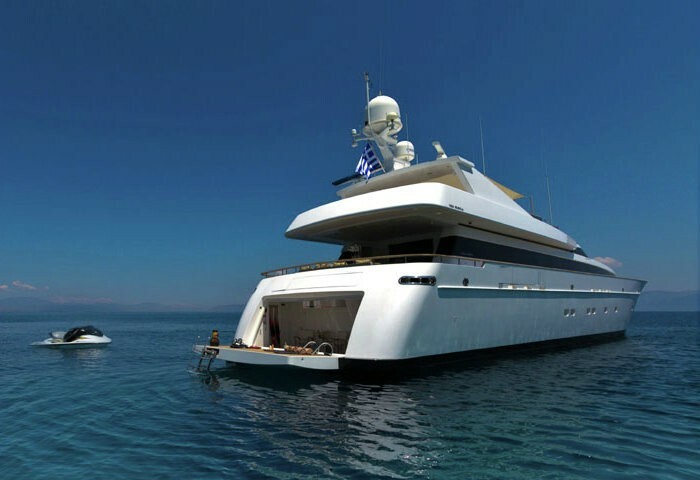 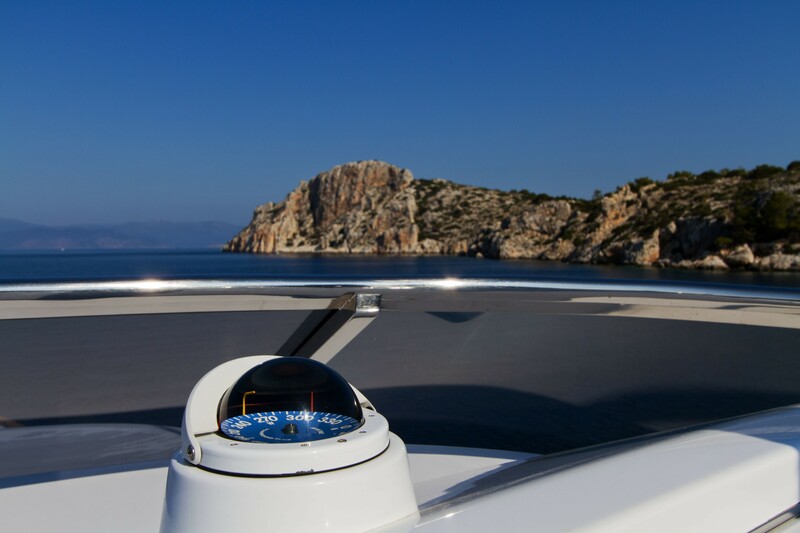 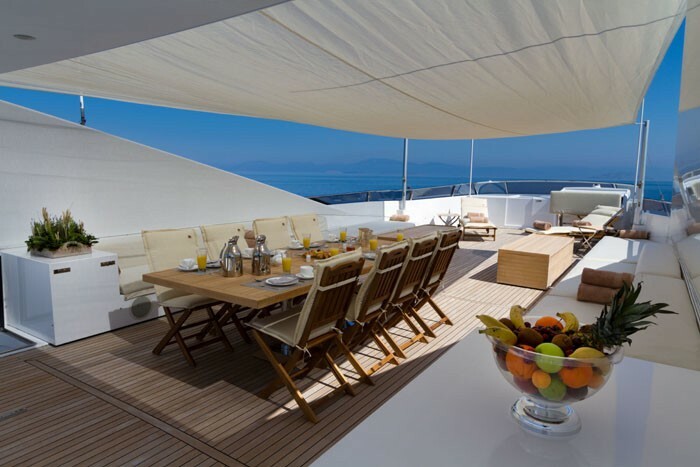 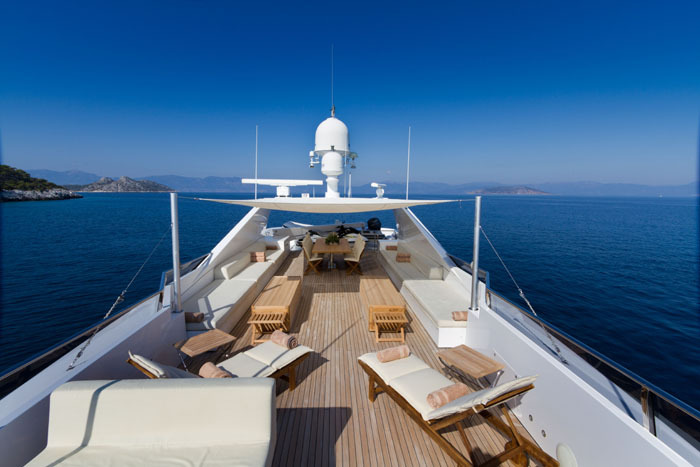 M/Y Mabrouk provides luxury yacht charters for up to 10 guests in Greece and the superyacht is based in Athens. 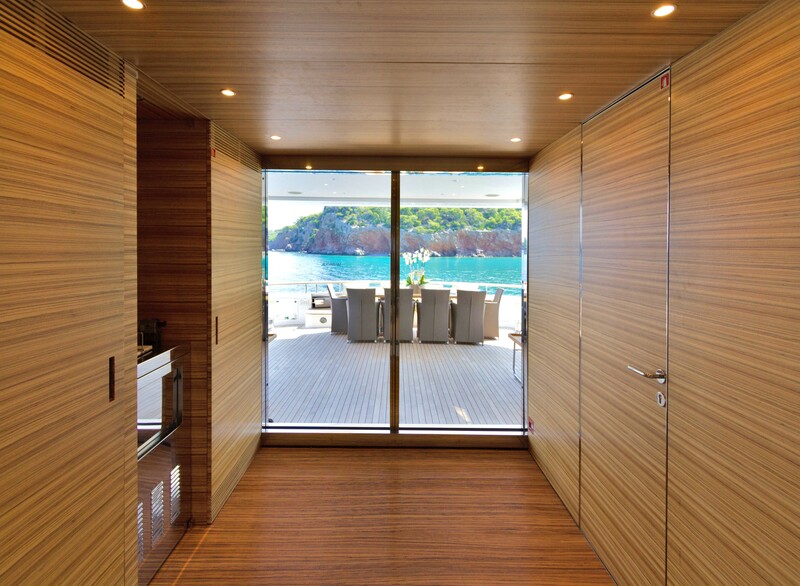 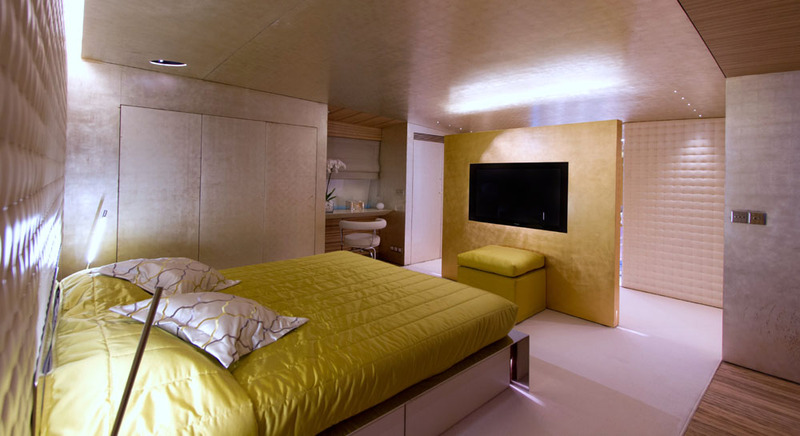 Charter Yacht MABROUK has a modern yet elegant interior; the keen eye for detail is evident throughout portraying a stylishly optimistic view on the future of design. 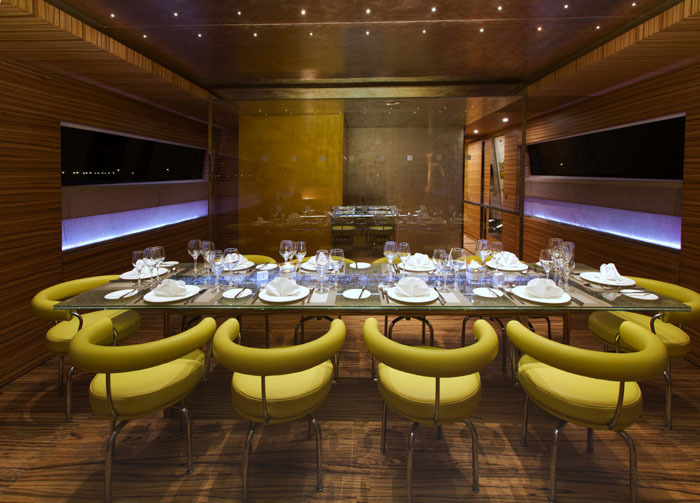 The salon and dining are spacious in an open plan. 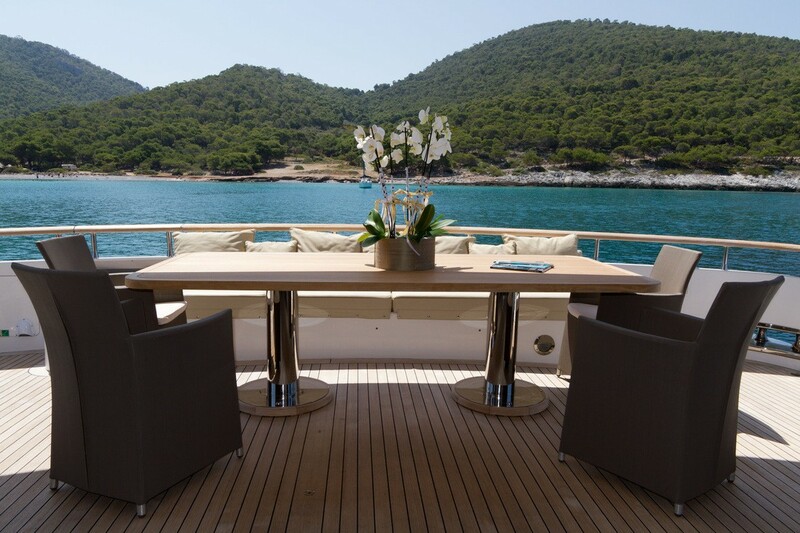 The salon features two long, sumptuous sofas and a set of Tulip chairs in white leather, a large white silk and linen rug lends the space a cozy feel while still allowing a voluminous feel. 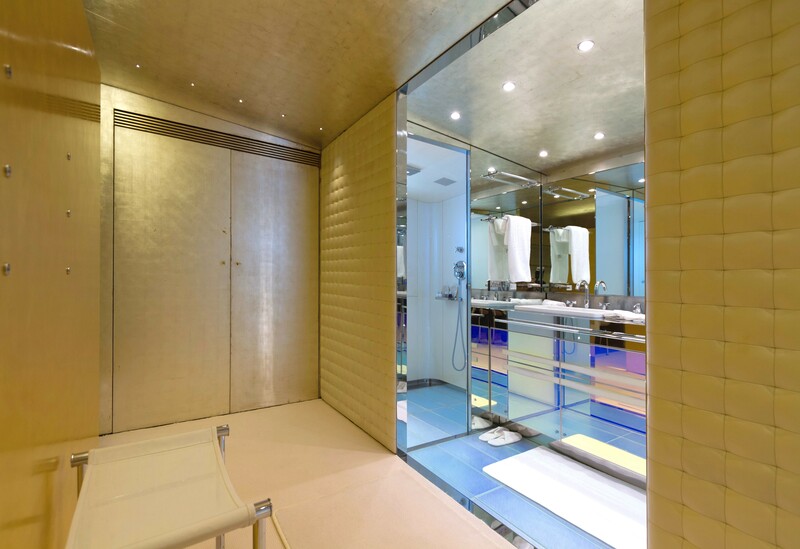 A low, silver leaf divider unobtrusively divides the salon from the dining area. 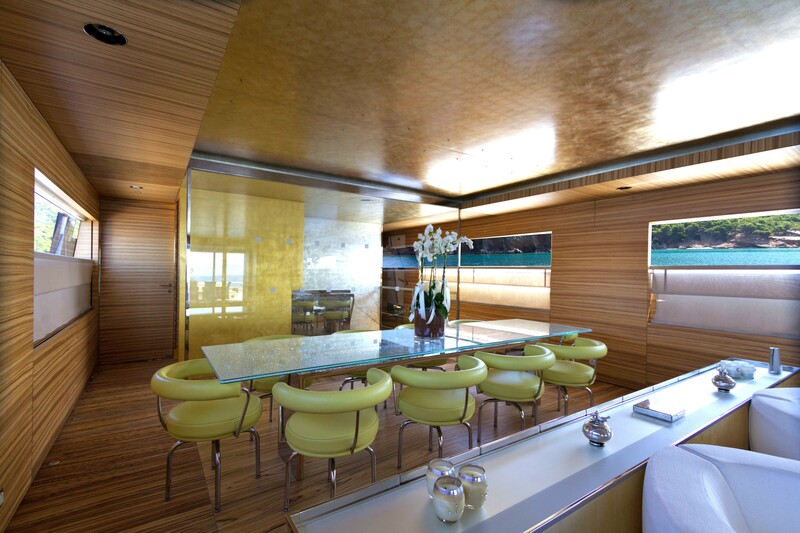 The dining table is a brilliant glass design, accented by stylish green leather chairs. 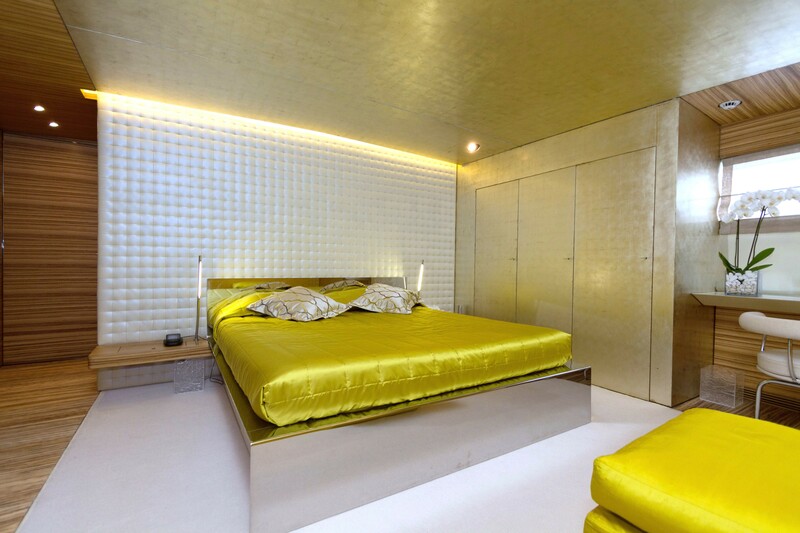 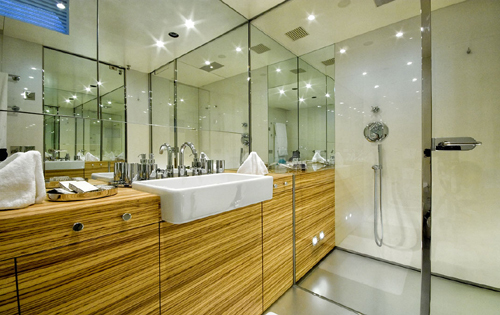 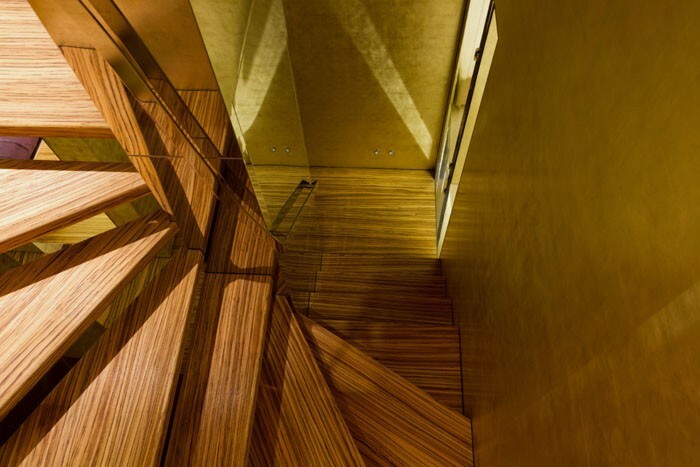 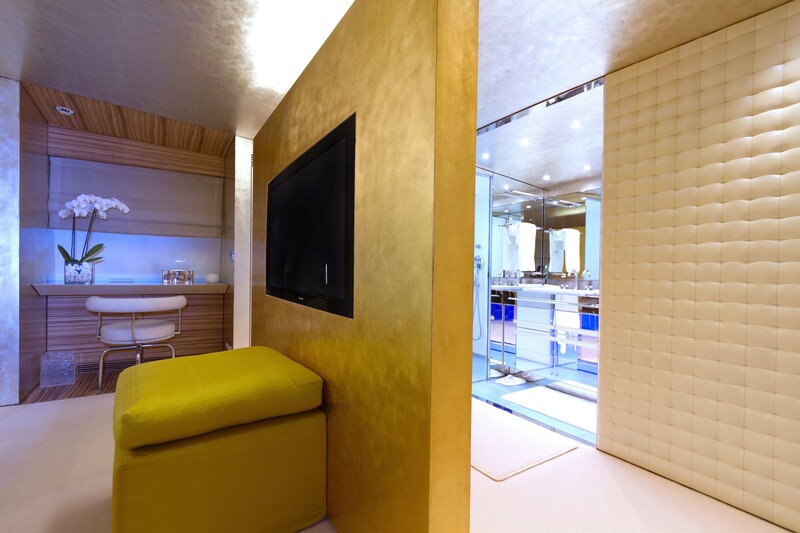 The entire area boasts a creative relaxing atmosphere in luxurious surroundings, large windows bring in ample natural light, the floors and panels are brilliant zebrano wood, while white gold and gold finishes on the ceiling magnificently complete the room. 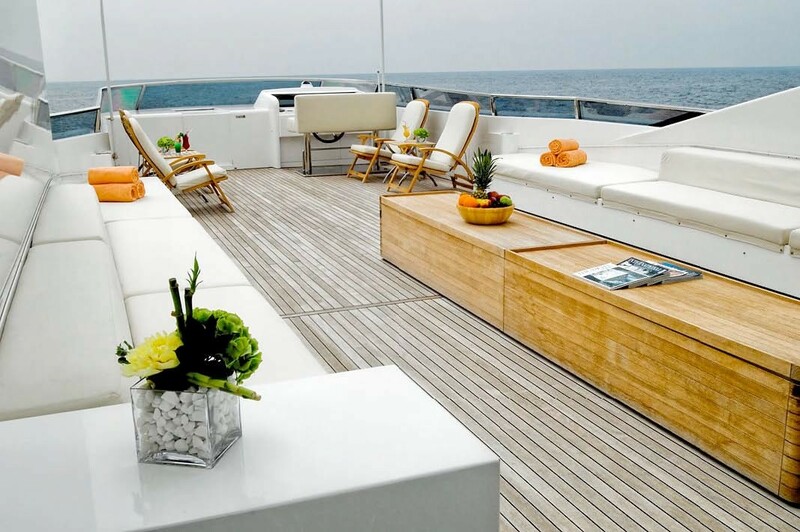 M/Y MABROUK offers guests plenty of external comforts, leading out aft of the salon through the wide pantry; the teak aft deck is large with an alfresco dining option. 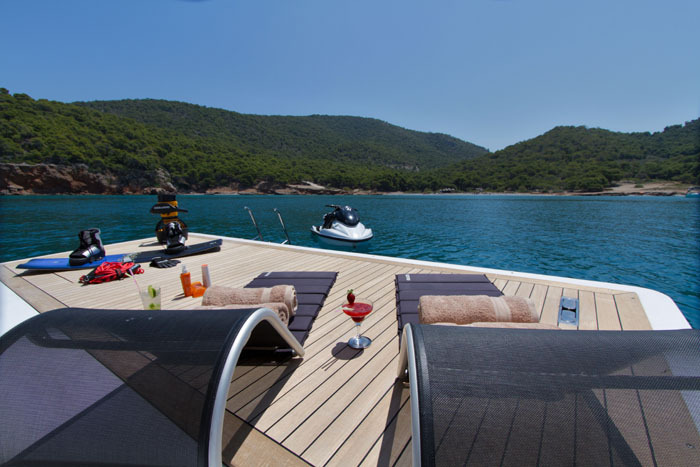 One may enjoy lounging with a book or simply watching the world go by, or head down to the retractable swim platform for a dip, play on the water toys or sunbath on the teak beach. 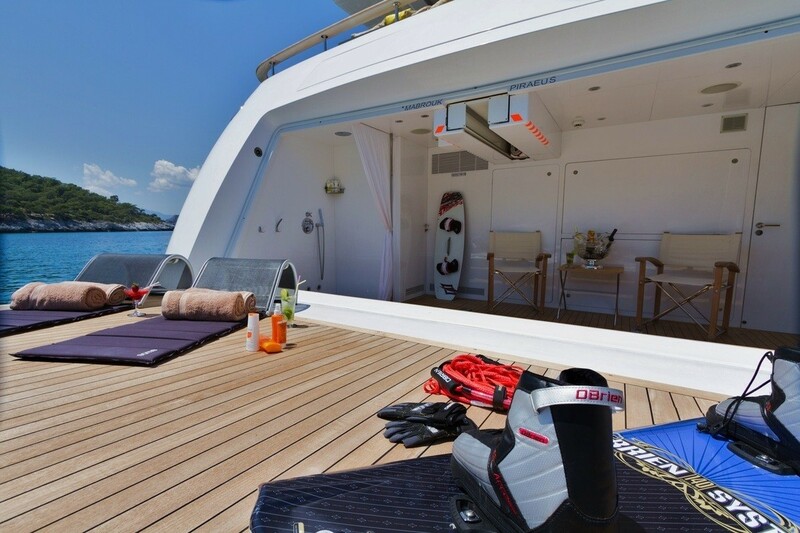 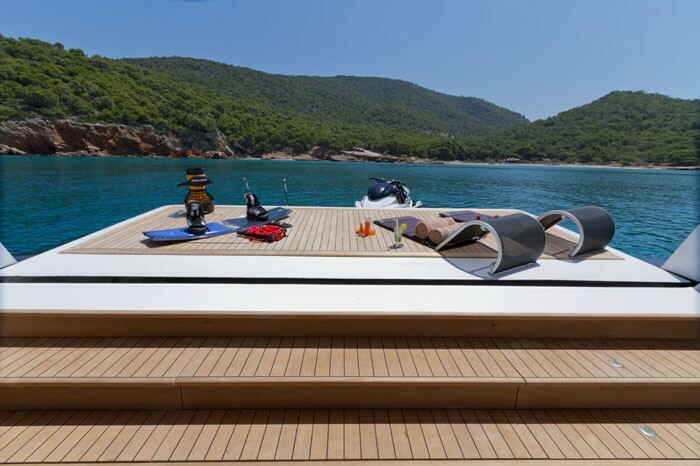 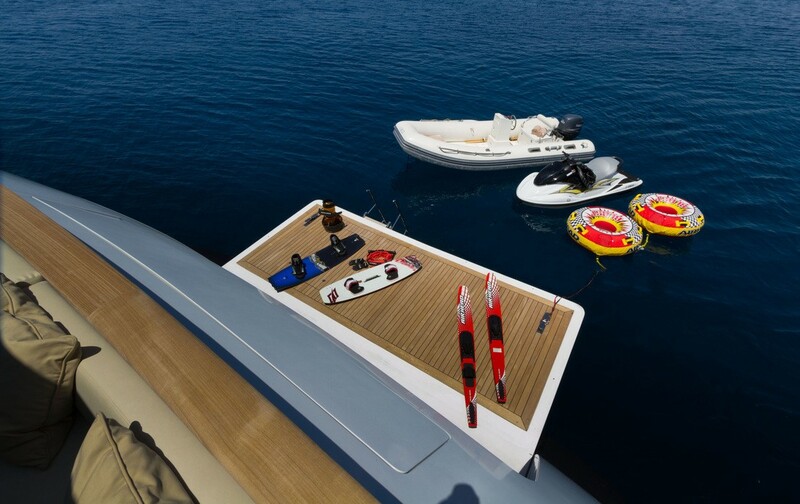 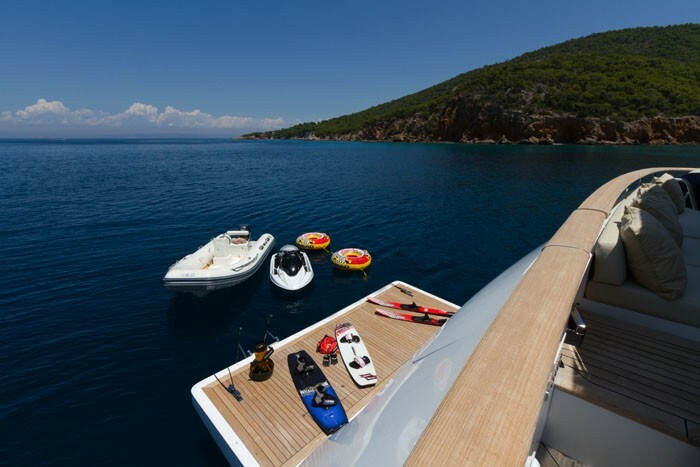 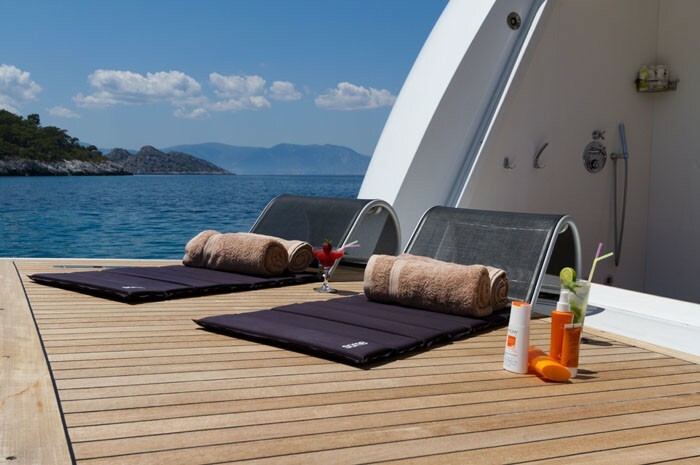 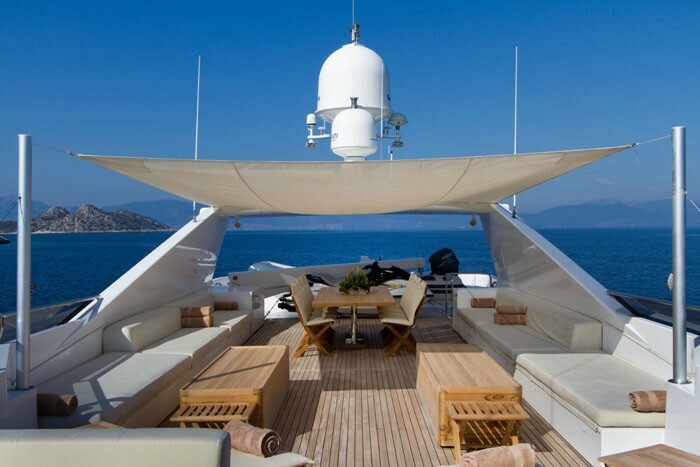 The foredeck offers a more private sunbathing option, while the sundeck is the social hub of the outdoors featuring 2 long lounges, sunpads, chaise lounges and an alfresco dining option. 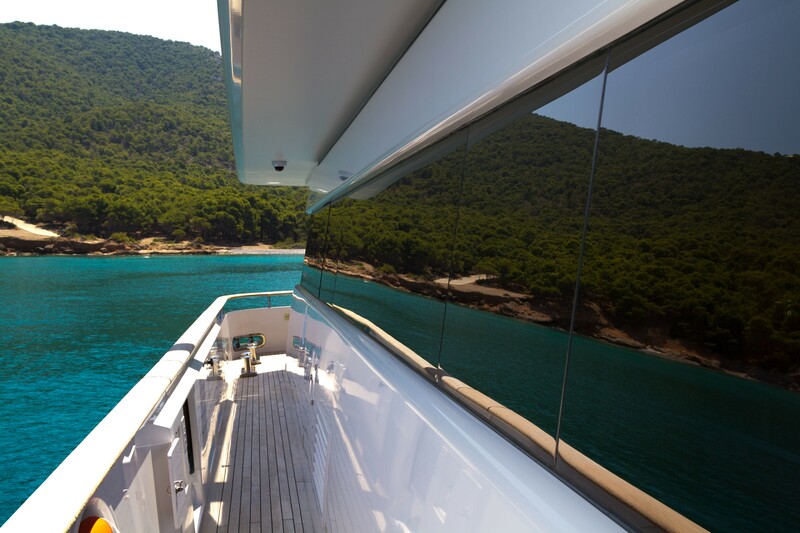 An optional Bimini is available for added shade. 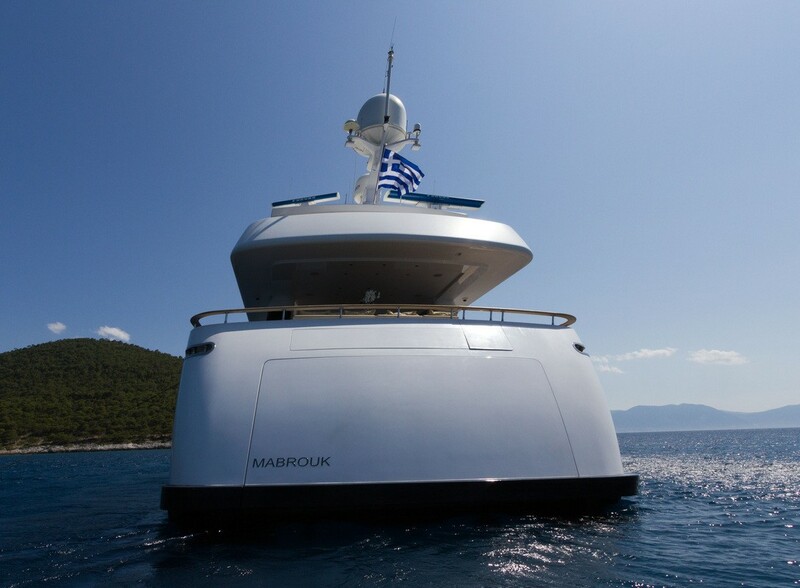 Luxury Motor Yacht MABROUK has a beam of 7.5 meters (24.6ft) and a draft of 2.2 meters (7.2ft), she cruises at a comfortable 23 knots. 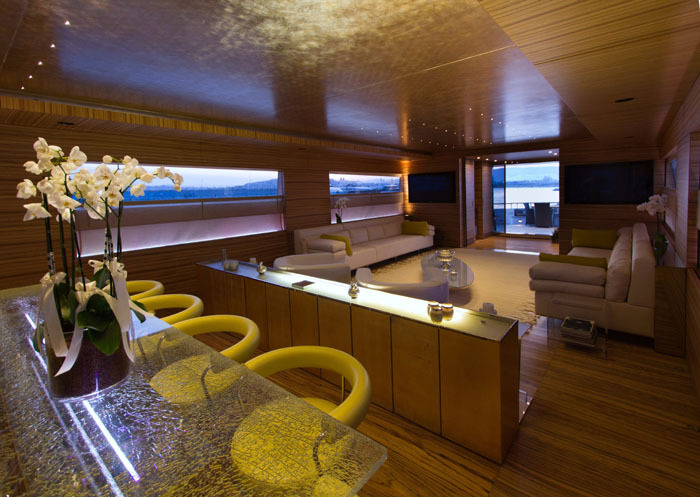 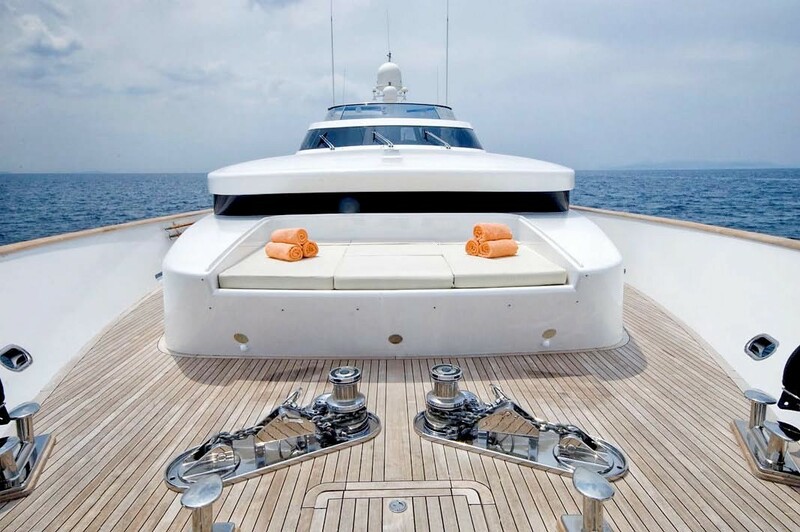 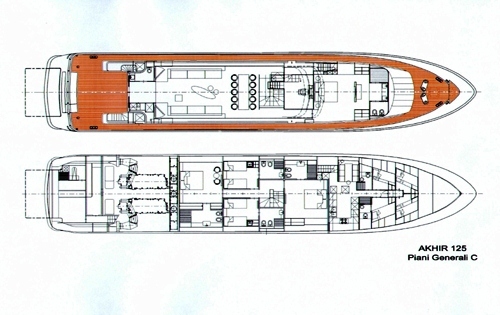 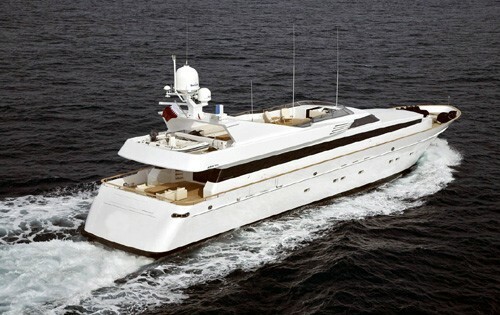 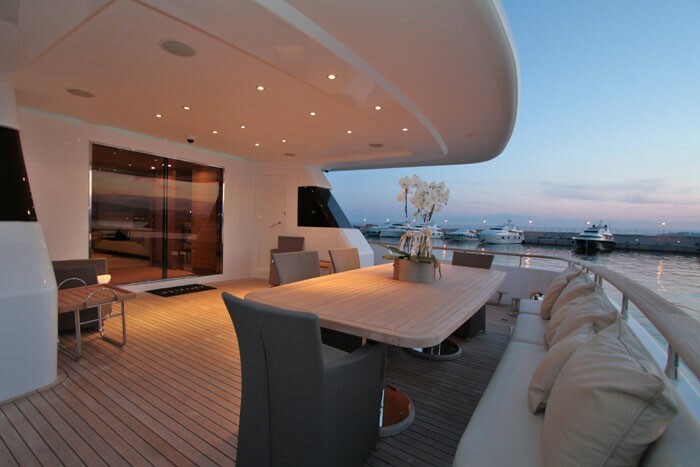 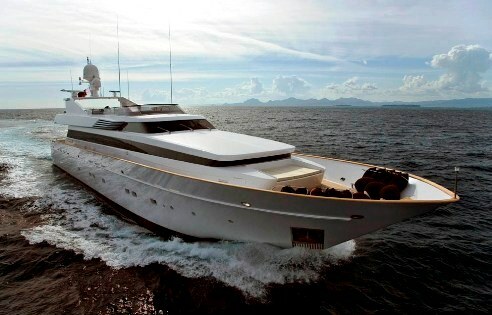 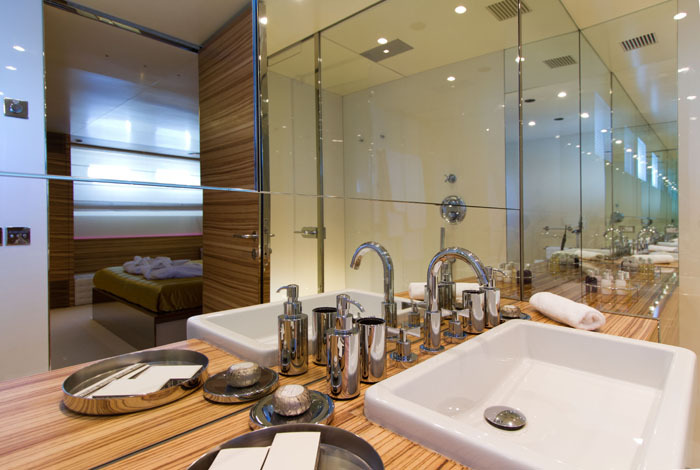 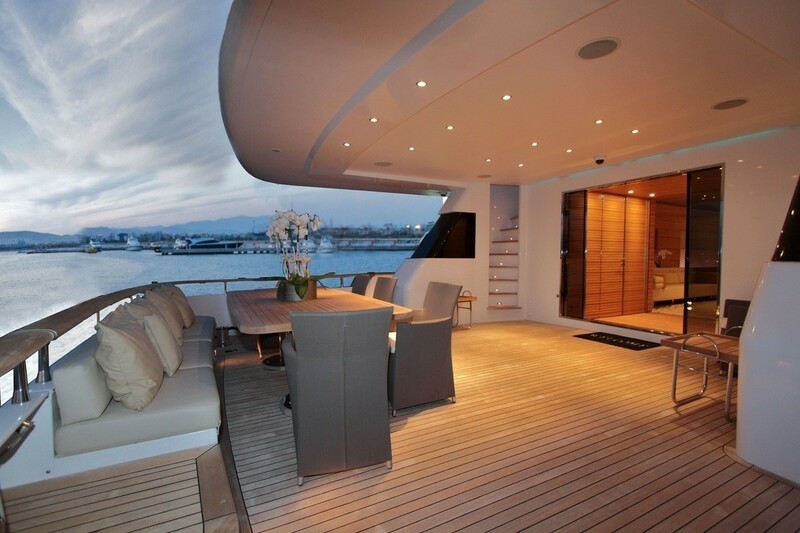 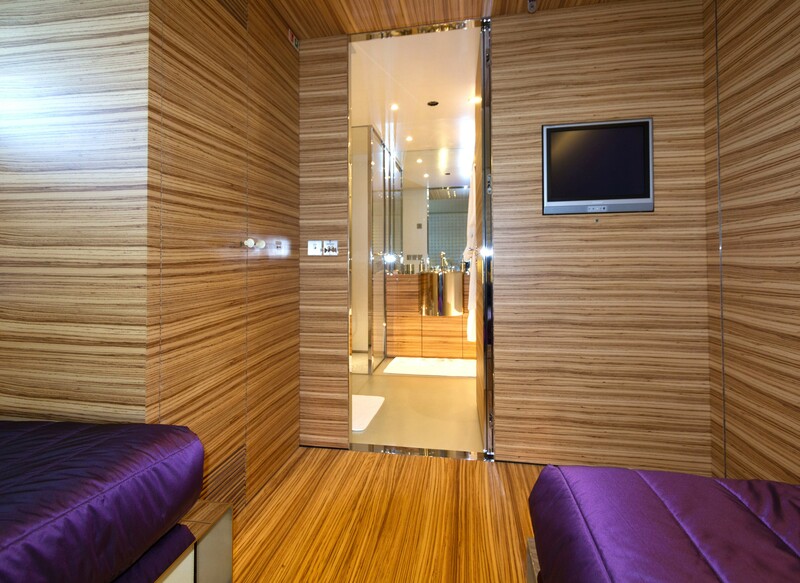 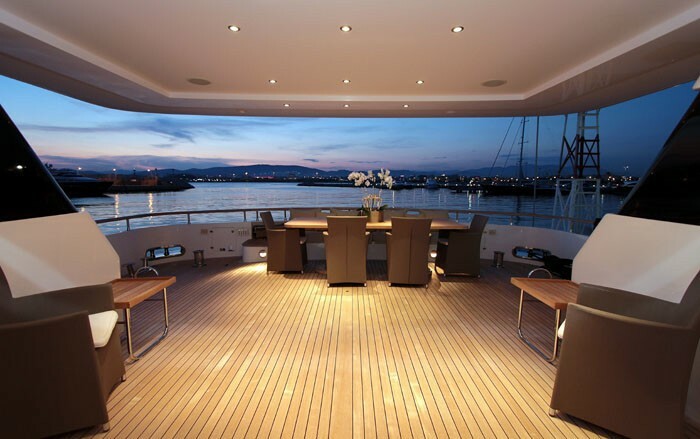 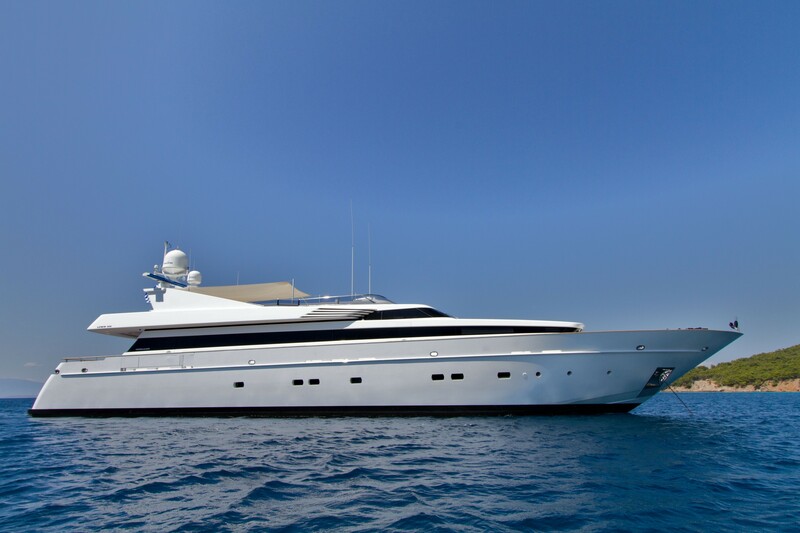 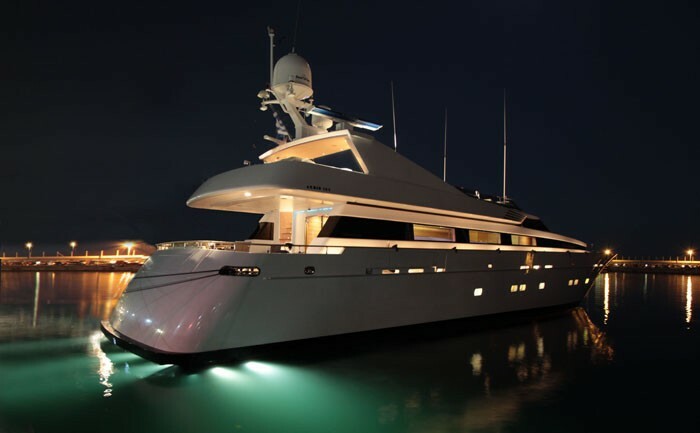 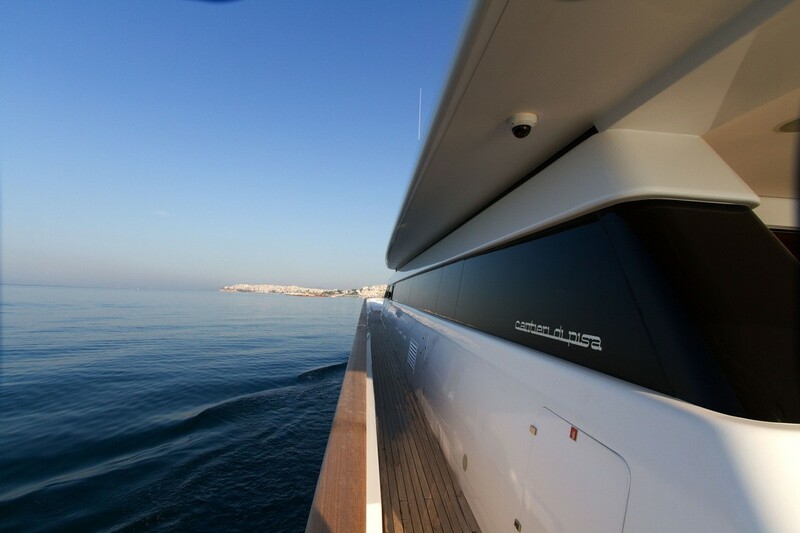 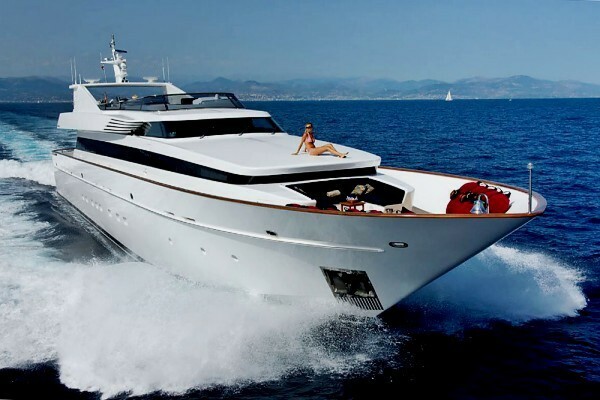 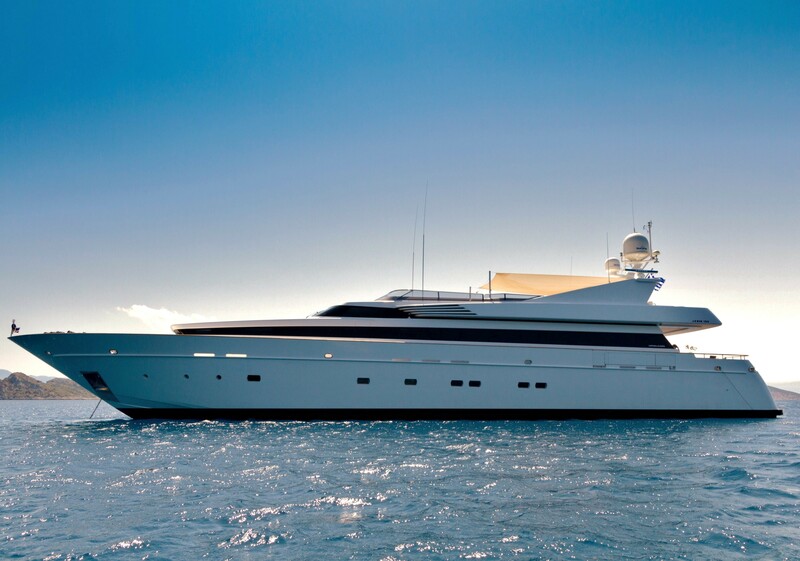 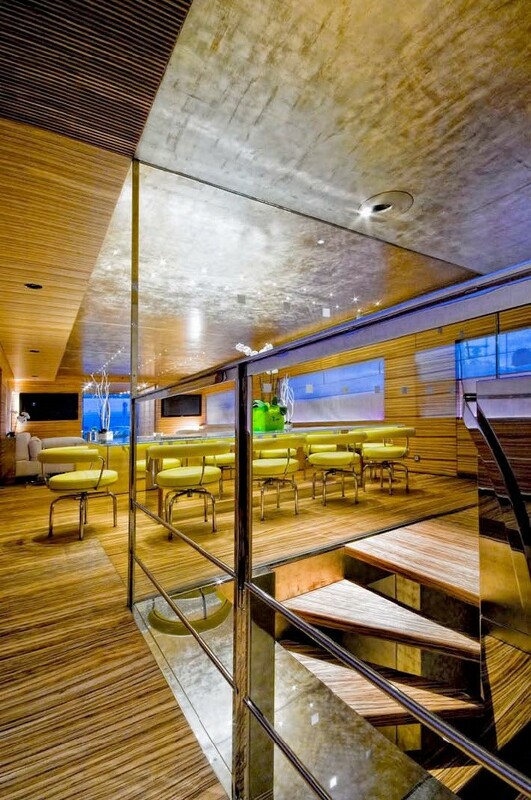 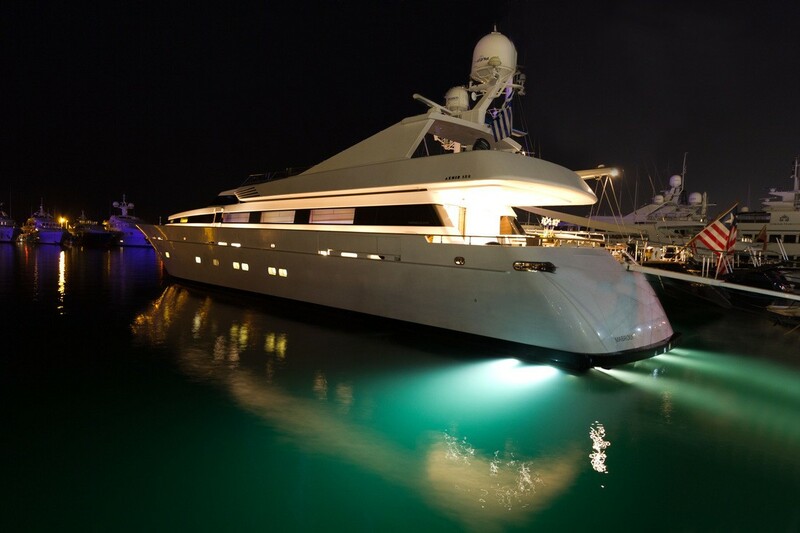 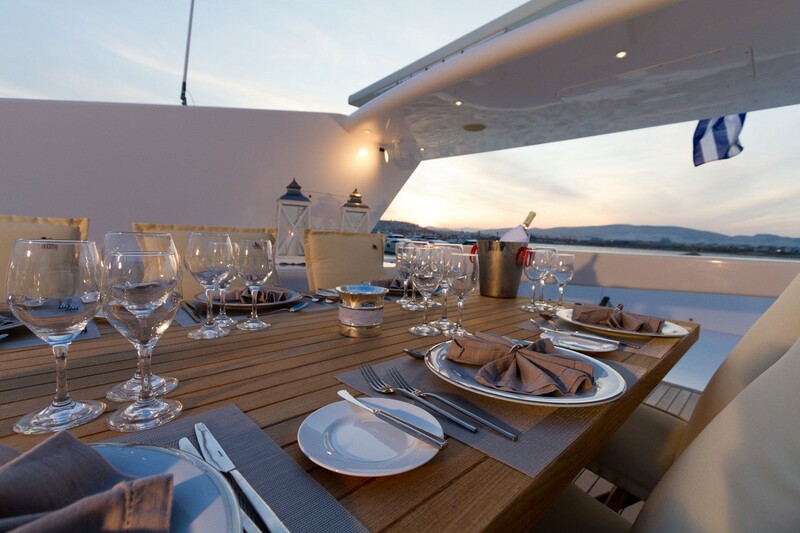 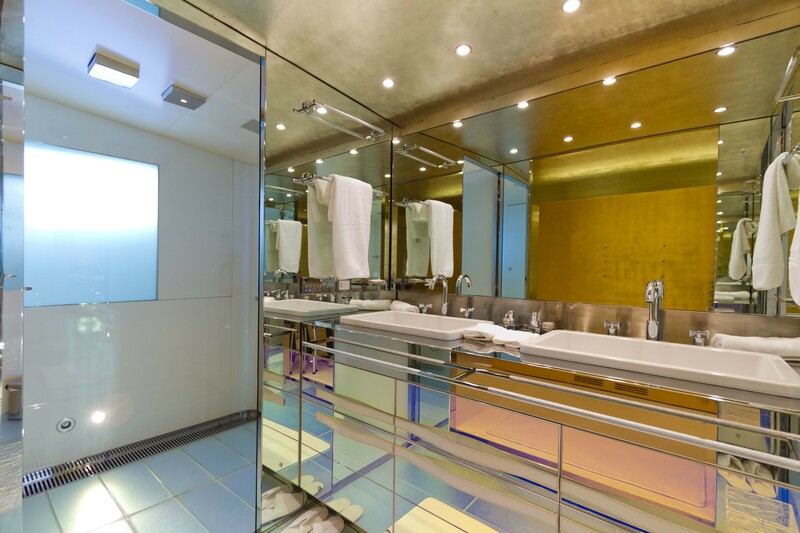 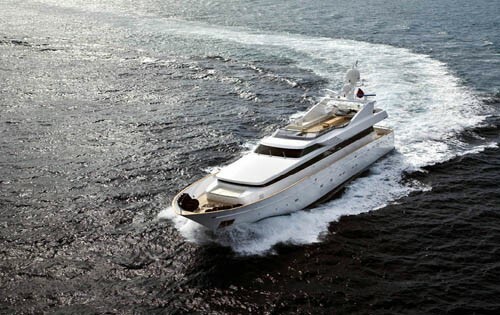 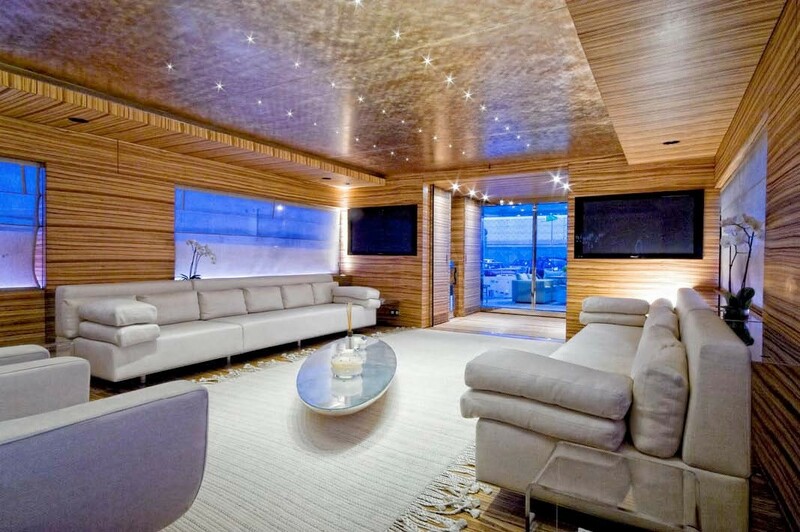 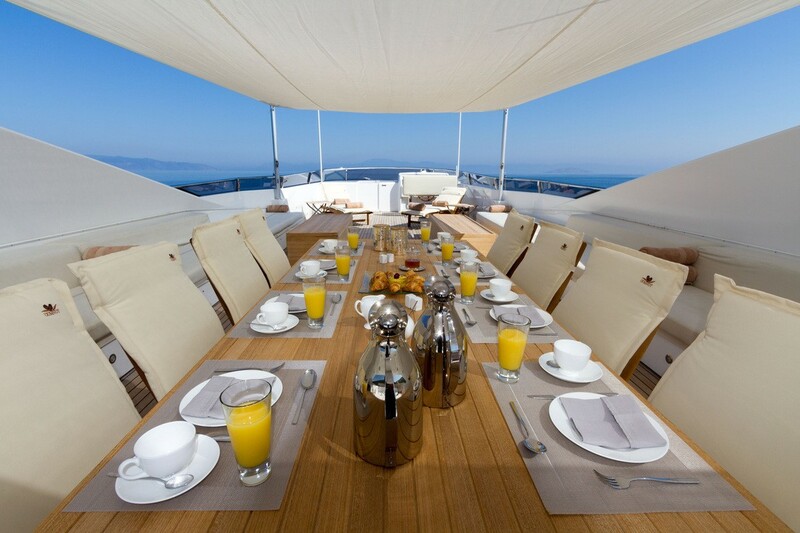 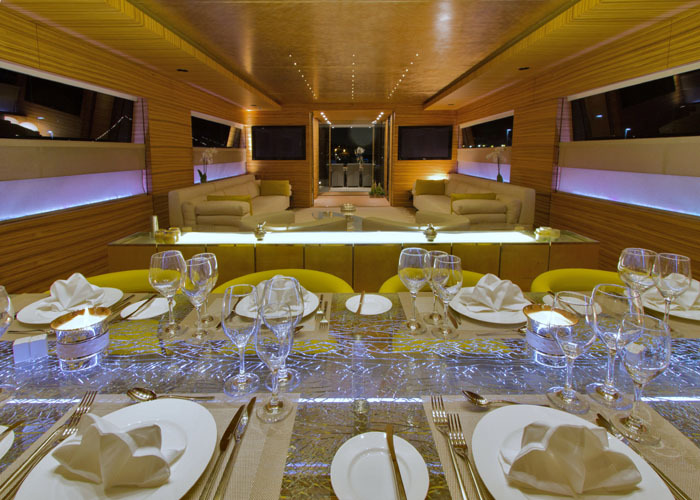 Motor Yacht MABROUK accommodates 10 guests in 5 superior cabins. The Master suite is forward on the main deck, and is as light and airy while still warm and inviting featuring a king size bed, large flat screen TV and en-suite facilities, the cabin boasts a chic décor with a white leather panel, zebrano woods and flecks of gold in the ceiling. 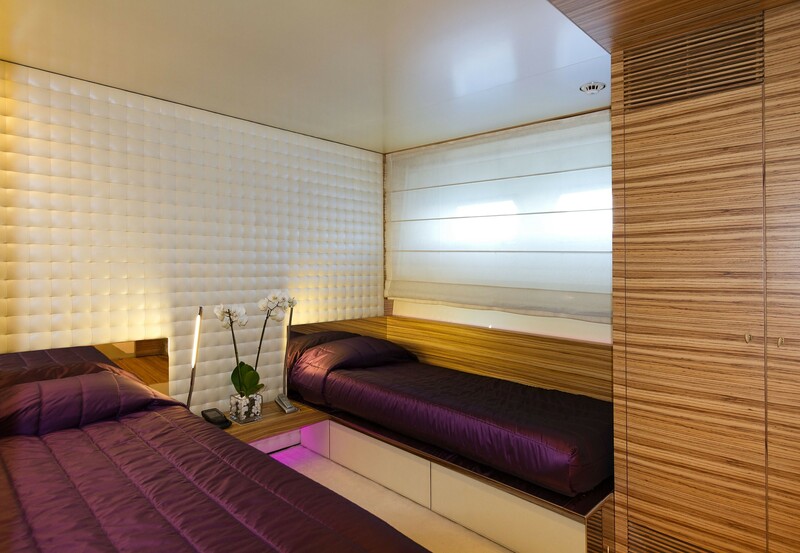 On the lower deck are 2 double cabins with queen size beds and a further 2 twin cabins, all cabins are en-suite and are furnished with similar creativity and loving attention to detail.